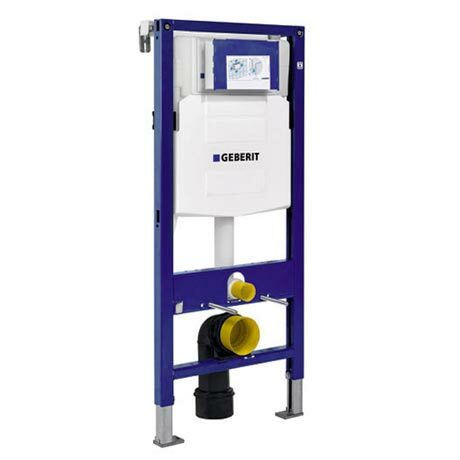 The duofix WC frame is manufactured by Geberit and is designed to be installed to support wall hung toilets. The 1.12m frame comes complete with the UP320 Geberit cistern. The cistern is to be used with the UP320 Flush plates. This high quality sturdy frame is built to the highest standards using the best materials. Q. What are the overall dimensions of this? Hi, the Geberit Duofix WC Frame with Cistern has the following dimensions: Height: 1120mm, Width: 500mm, Depth: 180mm. Thanks. Q. CAN I USE THE GERBERIT DUOFIX FRAME WITH A RAK RESERVA WALL HUNG TOILET? Yes you will be able to use this with the Rak wall hung toilet.